roasted coffee for your office! We’re passionate about providing exceptional coffee experiences everywhere … including offices. Delicious coffee in your office is an incredibly powerful tool to drive positive culture and generate community. Don’t compromise on quality! Whatever the size of your business, we’ll give you a discounted rate on fresh roasted coffee delivered direct to your door. 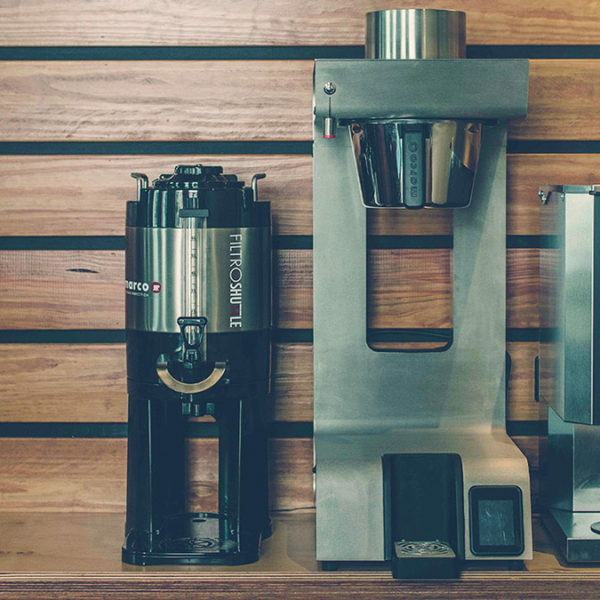 If you’re not the final decision maker on all things coffee at your office, no worries! We’re keen to help passionate specialty coffee lovers who are keen to see their office coffee offering improve. Be the office hero and fill in the form below, so we can send free samples. We’re firm believers that our delicious coffee will win over your team as soon as they taste it. The Five Senses Santa can help. We stock a wide range of devices from single cup brewers, batch brewers and office espresso machines. So whether you’re the solo office coffee consumer or you have a large team desperate for a daily caffeine hit, we’ve got your equipment needs sorted! Imagine drinking delicious, fresh roasted coffee every day. Thumbs up to increased job satisfaction and productivity. If you’re keen for the office discount, some free samples or you’re interested in new office brewing equipment, then shoot us your details below.